Going My Way is a film the public needed in 1944. 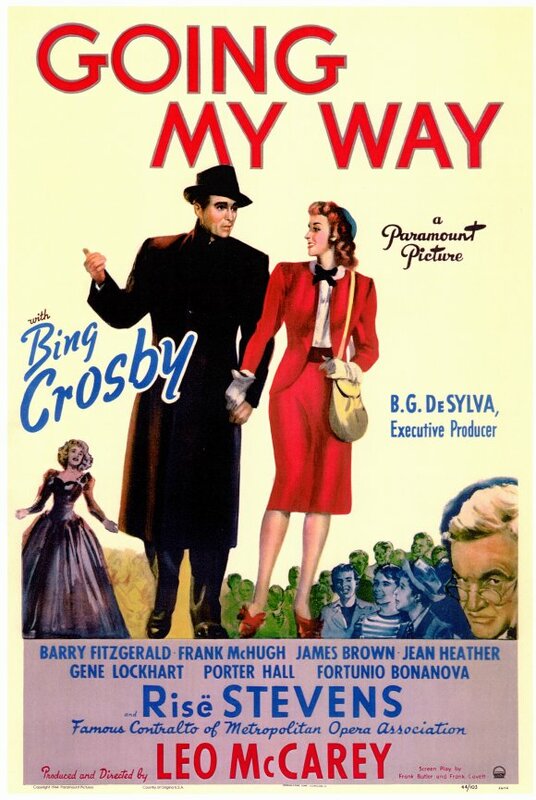 With World War II raging in Europe and the Pacific and hardships and sorrow impacting virtually every American, Going My Way was a feel good movie that depicted the generosity and caring of the American people. Throw in a number of classic renditions by superstar Bing Crosby and moviegoers could leave the theater a little happier and optimistic. The film focuses on a young priest, Father O’Malley (Bing Crosby), assigned to a New York parish that was experiencing financial difficulty. For the past 44 years, the church had been run by Father Fitzgibbon (Barry Fitzgerald) who was nearing retirement and was clearly set in his ways. The dialogues between the two priests as they express their differing approaches and philosophies to both the church’s and parishioners’ problems create some of the film’s most memorable moments. The film is entertaining but certainly dated – was American life really ever as like this? The portrayal of Irish Americans is so stereotypical that by today’s mores it is amusing – not a condescending portrayal but complete with Irish brogue, Irish whiskey, Irish priests and Irish policemen. The role in women in society, that of wife and mother and not “working girl”, is also evident; an interesting view given the number of women in the workforce in 1944 doing their part for the war effort. It seemed a bit of a stretch that Father O’Malley could reform a group of neighborhood delinquents into a choir after a single discussion. It did provide a great vehicle for Bing Crosby to deliver some wonderful songs. I had forgotten what a beautiful voice Crosby possessed. It may have been the remastered DVD we watched but I couldn’t believe the clarity and warm tone of Bing’s voice. Although “Swinging on a Star” won the Oscar for Best Song, I actually preferred some of the traditional Irish and Church hymns. I would be surprised if applications to the priesthood didn’t skyrocket based on the popularity of Going My Way. It is obvious the respect the whole community had for Fathers O’Malley and Fitzgibbon. In addition to being the neighborhood spiritual leaders, they also served the roles of community organizer, family therapist, youth counselor, financial advisor and musical director. Oh the good old days! An interesting Oscar trivia question – who was nominated for both Best Actor and Best Supporting Actor for the same movie role? – Answer: Barry Fitzgerald. He won for Best Supporting Actor losing at to Bing Crosby for Best Actor. The Academy changed the rules after the 1944 Oscars so Barry Fitzgerald was the first and last double nominee. Leo McCarey was a double winner capturing both Best Director and Best Screenwriting honors. Going My Way is an entertaining film that embodies the classic 1940’s Hollywood genre. The final scene of the unexpected visit of Father Fitzgibbon’s mother after a 44 year absence is a clever heartwarming surprise. Going My Way won’t make my favorite film list but was a worthwhile screening. 1944’s Going My Way can be summed up in two words, Bing. Crosby. He was one of the most famous actor’s in the history of Hollywood, and Going My Way can be considered the pinnacle of his acting achievements because it resulted in his Best Actor award. Not to diminish his role in Irving Berlin’s wildly successful White Christmas, but Going My Way was a better showcase of his acting talents. Going My Way was also one of the first times that a successful A-List movie spawned a sequel, The Bells of St. Mary’s. In both films, Bing plays Father O’Malley, the likable, scrupulous priest sent on a mission to help revitalize a struggling New York parish. Bing was also nominated for best actor for The Bells of St. Mary’s, but lost to Ray Milland for his portrayal of Don Birnam in The Lost Weekend. 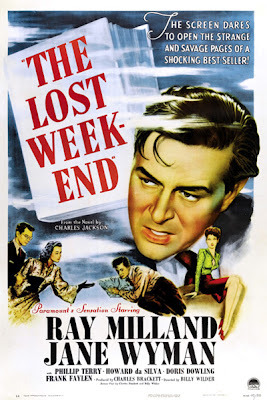 For more information on The Lost Weekend, read our next blog post on 1945’s Best Picture winner. Released just a month prior to the D-Day Invasion, Going My Way was different than the last few best picture winners because it had much less to do with the concurrent war. However, with the tolls of war mounting on the home front, Going My Way provided escapism at its finest. Bing Crosby’s voice, cut through the tension of the time, to remind America what it was even fighting for. The onscreen chemistry of Crosby and Father Fitzgibbon (Barry Fitzgerald) was palpable, as the duo’s relationship evolved from terse to familial. Father Fitzgibbon has become an old curmudgeon in his 44 years of service to St. Dominic’s church, and is originally put off by Father O’Malley’s antics like playing golf and tennis. It is later discovered in the film that Father O’Malley was actually sent to revitalize the troubled parish, and help prevent an impending foreclosure at the hands of the mortgage company run by Ted Haines Sr. (Gene Lockhart). One of the best developed plots in the movie comes from Father O’Malley’s relationship with a group of neighborhood children (not in that way!!!! Get your mind out of the gutter.) He takes a group of troubled mischievous hoodlums who were more interested in shenanigans than actually being productive members of society, and turns them into an angelic singing boy’s choir. The choir is put to the test as it performs signature songs of the film like “Swinging on a Star” and “Going My Way” in order to attempt to save the financially impoverished church from foreclosure. Finally, I can’t review this film without mentioning the most moving scene of the film. Father Fitzgibbon disappears on a rainy night, and Father O’Malley and his police contacts go out looking for the missing priest. After he is found, he returns to the parish very weak and sickly. Bing sings the song an Irish Lullaby (Too-ra-loo-ra-loo-ra) to Father Fitzgibbon to help ease his pain and longing for his homeland of Ireland. Overall this film is a great and heart-warming family classic that uses morality and beautiful song to tell its story. I can definitely see the impact this film had on a country at war that needed a distraction from its strained day-to-day life. It’s worth viewing, for Bing Crosby’s voice alone not to mention his fantastic acting.